I’ve been a fan of artist Kelly Jones ever since I first saw his art in The Sandman #17. Quirky, dark, emotive, impressionistic, and evocative of 1950s sci-fi/horror, Jones’ style is amongst the most striking in all of sequential art. His characters’ anatomy might be as proportional and realistic as those featured in the early Image Comics’ issues of Youngblood, but it is not from a lack of artistic talent. Jones’ art is meant to bend the reality of its subject matter and create a sense of emotive storytelling that is entirely unique to the visual experience of comic book stories. 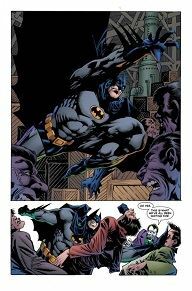 While Jones is often best suited to extreme sci-fi or horror subjects, he is very much at home when drawing highly atmospheric Batman stories for DC Comics. Every few years or so Kelly Jones fans are treated with the master penciller’s return to the most high profile character he’s drawn, and 2018’s Batman Kings of Fear proves that he’s still worthy of being referred to as one of the best Batman artists of all time. 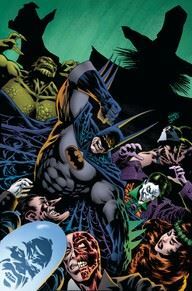 Teaming up with Jones on Batman Kings of Fear is writer Scott Peterson, the former Batman line editor who helmed the titles during the “Knightfall” storyline of the 1990s. Both men have a very long history with the character, as well as his rogues gallery, and are perfectly suited for the telling of an out of continuity, but not out of canon, Batman story that features Bruce Wayne/Batman facing not only the fear inducing gas, and ghastly machinations, of one of his most frightening foes, The Scarecrow, but fears of self doubt of the type that haunt everyone from the Caped Crusader himself to his most avid readers. Peterson’s characterization of The Joker, who commands the most panel time, and is the most loquacious character in this first issue, is spot on. The brooding, short spoken Batman is also smartly and intuitively rendered. The theme, which emerges early on, is not unique to the Batman canon, but is deftly revealed peripherally through the narrative, and of course, the artwork. While Jones is a master at shading and detail, and his artwork would be as beautiful denuded of color as well as fully colored, it is more than enhanced here through the brilliant work of Michelle Madsen, who previously worked with Jones on such titles as Convergence: Swamp Thing and Batman Gotham After Midnight. As was the case with her work with Jones on both titles, Madsen’s bright, yet wonderfully nuanced and multi-shaded colors meld inseparably with Jones’ pencils and inks to complete the visual story that Jones and Peterson are telling. It would be a vastly different, and inferior, rendering of Batman Kings of Fear without her influence on the visuals. Batman Kings of Fear is a 6 issue mini-series that is worth picking up in single issue form, and dare I say it, again later on in the trade format. I will most likely be getting both versions, as this is one of the Batman stories that I simply cannot trade wait for. I’d love to see more regular Kelly Jones/Batman product from DC Comics, but the periodic release of these titles will have to suffice. I’m just glad Jones hasn’t lost interest in the character after all these years.